With all the recent attention given to the tech entrepreneurial ecosystem in New Jersey by the governor and others, very little has been said about TechLaunch, the virtual accelerator that holds a pitch competition called “BullPen” every two months at various university venues throughout the state. Founded by Mario Casabona, who also founded Casabona Ventures (Kinnelon), BullPen is a way to expose angel investors to New Jersey startups that are usually a bit further along on their business trajectories than the ones that typically pitch at tech meetups. The startups that pitch at BullPen events have a team and are already making some income. During his many years as an angel investor, including when he started New Jersey’s first tech accelerator, Casabona noticed that local startups could use some coaching from experienced mentors on how to better align their business models and give coherent pitches. The program was started in order to give angel investors in New Jersey access to more “derisked” startups that are ready for investment. Investors call this concept “dealflow.” Each startup gets a mentor to help them on their journey. At the BullPen events, the audience gets a chance to ask the startups questions, and the judges give the startups feedback. The judges are usually well-respected entrepreneurs, angel investors, academics or other members of the New Jersey tech ecosystem. At the end of the evening, two awards are presented: an “Audience Choice” award and an award from the panel of judges for the “most fundable” startup. The latter includes up to $20,000 in services from TechLaunch sponsors. The hope for the startups is that this process will lead to investment, so they can further grow their businesses. Over the time that TechLaunch has been operating the BullPen events, a number of New Jersey startups have pitched. In fact, this competition has been very friendly to New Jersey women founders, with recent startup winners Welnys ( Jersey City), Carii (Pilesgrove) and KidGooRoo (Fair Haven) all led by women. Each competition also gives one select student from the associated universities a chance to compete and exposes them to the type of sharp questions and insightful advice they would get if they were already in business. Not all of the startups that pitch have been from New Jersey, but the competition does give the state’s startups a place to make the best case for their businesses, face some tough questions and receive feedback. For example, at the competition that took place in September, in conjunction with Princeton University, three of the presenters were from the Garden State: Afari, the Princeton student entry now located in Hoboken; LiveShopBuy, in Holmdel; and Safe-Com Wireless, also in Holmdel. Only one startup was from out of the state: Diamond Hedge, based in New York. 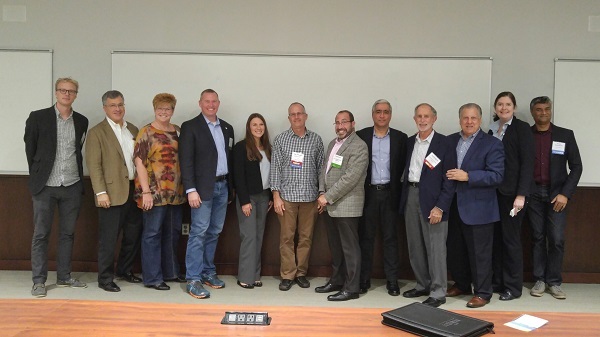 The winner was the seasoned team from Safe-Com Wireless, whose presenter was cofounder and CEO Stephen Clark. Cofounder and CTO Henry Wojtunik was in the audience. The company claimed both the audience award and the judge’s honors. He noted that the product had grown out of a problem highlighted on 9/11 when responders who entered the World Trade Towers could no longer communicate effectively with the outside world. It turned out that this was a worldwide problem. “We have a suite of products, leading-edge patent-pending products that can address the market,” he said. 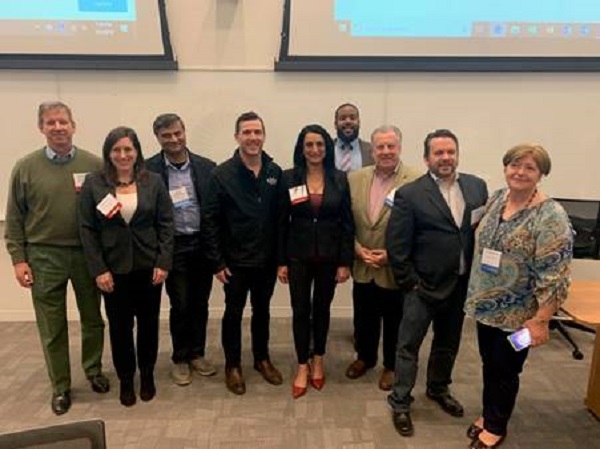 At the Nov. 14 BullPen at Monmouth University, three startups competed for the $20,000 prize: Caregiver Smart Solutions based in Pompton Plains; Road2College from Penn Valley, PA; and Tendo Technologies of Princeton. The student entry from Monmouth University was MedEd, a promising health tech option. The audience voted for Tendo Technologies, a pure tech company that has developed a totally new flow sensor. Tendo’s products can be used in a wide variety of industries, but the startup is targeting the fregrances industry initially. The award recipient was Caregiver Smart Solutions. Caregiver targets family members and organizations that take care of seniors aging in place. The startup offers sensors placed strategically throughout a loved one’s home to track their movements and habits. The sensor information is managed through machine learning and predictive analytics. Caregivers are notified if, for example, the elderly person goes into the bathroom and doesn’t come out for a very long time. Ryan Herd, founder and CEO, put this system in his father’s house to see how it would work. The system was able to tell that his father, a cancer survivor, was not taking his one o’clock medications on time each day. “This system allows you to ask the right questions and reduce your stress levels,” he told the audience. Road2 College helps families manage the confusing and complex process of college financial planning. As part of the New Jersey tech ecosystem, TechLaunch gives startups a unique way to get their stories in front of investors, and the needed support to help their businesses thrive.